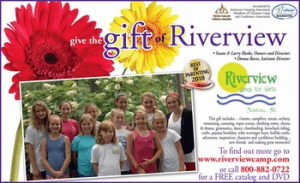 At Riverview, we offer short and long-term sessions for girls ages 6-16. It is not uncommon for sessions to fill up quickly, so don't wait too late to submit your application! You may apply online, or contact us to apply by phone or mail. We have between session activities planned for combination session campers! 5-week combo $9,285; 6-week combo $10,950; 7-week combo $12,940; 8-week combo $14,575; 9-week combo $16,535 Call the Office to learn more! These customized combinations allow for a continuous stay. If you would like to split your stay you are welcome to combine any of our Sessions M, A, B, 1, C, D, 2, 3, E, F, 4. Example: M & 3 or 2 & 4, or B & C, etc. Choosing any of the Short-Term combinations (Example B & C) results in the Long-Term Fee. Discounts are available for campers; be sure to learn about and take advantage of them! This discount is announced each summer and varies, but is valid on applications received before September 15 and voids all other discounts. For applications received between September 15 and December 1. For girls that attend more than one session in the same summer. $35 discount for each additional short-term session; $75 discount for each additional long-term session. After the first girl from a family registers, each sister from that family receives a 10% discount. Pre-registration Discount voids sister discount. For girls ages 13-16 only. Get the opportunity to be a camper and participate in our WCIT Program; help set and wait dining room tables at meals. Attend camp at a discounted rate as a Working-Counselor-In-Training, a very high profile position; everyone knows who you are! Call 800-882-0722 for a CIT packet and WCIT application. Limited Spaces: Only 8 are accepted each 2 week session. WCIT $500 discount voids all other discounts. Don't just take it from us, let our campers do the talking! Please submit your application as soon as possible. We will take campers on a first-come basis and on a space available basis. If it is necessary for you to change a session later in the year, we will do our best to accommodate you. THERE IS NOT A DEADLINE and we continue taking applications until spaces are unavailable. You will be notified quickly if you have to be placed on a waiting list and we will hold your application in order of arrival until a space is open and then process your application. If you have additional application questions, please call us at 800-882-0722 so we can help you. If you take advantage of early registration, the above schedules may work perfectly for you. We also offer an innovative automatic billing option that you can take advantage of by submitting your application online. If registration is canceled prior to April 1st, total payment (less deposit) will be returned. Deposits are non-refundable. If cancellation occurs After April 1st, no refunds will be given. When do I submit an application? This girl is going to Riverview! Are there any discounts for early enrollment? Applicable Discount Information •Before Sept. 15 - is an early bird discount. This discount voids all other discounts. Multi-session discounts - $75 for more than one two-week session and $35 discount for an additional one-week session. •10% Sister discounts for the 2nd and 3rd, etc. sister in the same summer. What if my child needs to arrive early or stay late? For campers to receive the greatest benefit from our program, parents are STRONGLY urged to observe both check-in and check-out times. If these hours or dates cannot be adhered to, special arrangements must be made with the camp office. Early arrival: Should early arrival be unavoidable there is a $275 fee for one extra night in camp. Additional days/nights will be pro-rated based on the session fee. Late departure: Extended days/nights past the regular check-out day of the regularly scheduled session will be prorated based on the session fee. 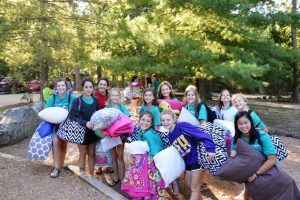 What are the payment options for camp? If you are a person that likes to plan ahead, you may choose our monthly payment option…otherwise, payments are due in November, February and the balance is due by May 1. Riverview accepts credit card payments for your convenience. Will I receive a refund if my child does not attend the full session? Late arrival: There is no reduction in fees for late arrivals. Early departure: In case of leaving camp early due to documented physical illness, the camp will credit the unused camp fee as a pre-registration deposit for the next year. Otherwise, there is no refund or credit for any other early departure reason. What if I have to cancel my child’s camp session? Deposits are non-refundable. If registration is cancelled prior to April 1st, total payment (less deposit) will be returned. No refunds will be made after April 1. Non-refundable amounts may be transferred to the following year for the same camper or a sister. For session changes after April 1 that reduce the fee, the credit balance will be transferred for trips or transportation fees and the following year registration. 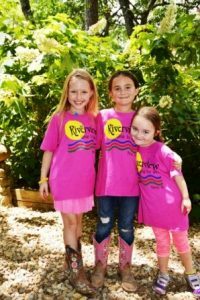 What ages attend Camp Riverview? Girls ages 6 to 16! We have accepted campers that are about to turn 6 as well, if you as a parent feels she is socially independent enough to enjoy camp! We have adequate numbers in all age groups. 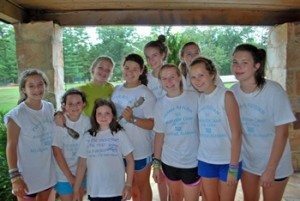 It is an amazing combination of wonder and delightful camaraderie as girls of all ages enjoy camp together, while taking activities and living in cabins with their own age/grade range! Delightful families! You will join other families who seek opportunities for their daughters to be in Christian environments for safe, exciting and fulfilling opportunities, including the getting to meet girls from a diversity of families and faiths. We are privileged to have many campers of moms who were themselves campers and counselors with us! How are the one-week sessions and two-week sessions structured? Some campers enjoy combining one-week and two-week sessions for a 3 week or longer stay. (Example Session M and Session 1). One-week or two-weeks or more…what is best for my child? ne-week and two-week campers will enjoy the experience and benefits that camp offers. Most of our campers attend a two-week session, though we have one-week campers who attend each session. If possible, we recommend that your camper attends for two-weeks. Campers tend to get “settled in” during the first week and the following week they spend more time developing skills in activities, making stronger friendships and enjoying the feeling of “my camp”. While this experience begins and is meaningful in the one-week program, it is firmly absorbed in the two-week progression. If she initially signs up for one week and wants to extend her stay, you may add on another week, if there is a space available! Each session we have campers who are multi-session campers who attend three, four, five, six and even eight weeks. Multi-session campers enjoy a chaperoned excursion between sessions to nearby Chattanooga. What if I have one child that I want to send for two weeks and another child that I wish to send for one week? As you can see our one-week options are a part of our two-week sessions! 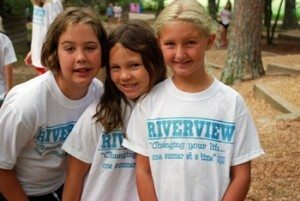 If you have more than one child that you are sending to Riverview and you are considering sending one child for two weeks and one child for one week, we recommend that, if possible, the one-week camper attend the second one-week program in that session! It is usually easier for your two-week daughter to anticipate the arrival of her sister than for her to have to see the departure of her sister in the middle of her two-week program! 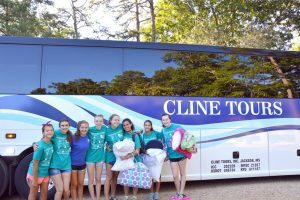 While most parents drive their girls to camp, we offer chaperoned airport pickups in Chattanooga, Birmingham, and Atlanta. As a service, we offer limited chartered, chaperoned buses that normally include Baton Rouge and/or Covington/Mandeville, LA; Mobile, Evergreen, Montgomery and Birmingham, AL. Riverview Camp guarantees no alternate means of transportation should the chartered bus need be cancelled. 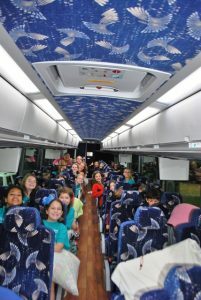 Campers enjoy the trip to and from camp with friends or meeting new friends! 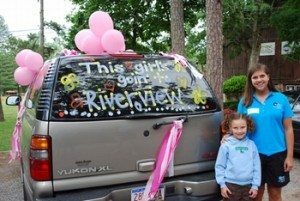 Parents are responsible for the full cost of transporting their campers to Riverview. Detailed information can be found in our Parent Information Guide and in the Parent Handbook that we will send out in the spring. 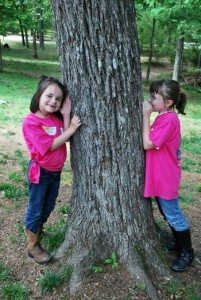 My daughter is a younger camper; will her daily needs be met like they are at home? 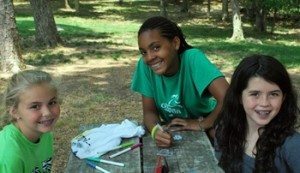 We understand that the younger camper needs more guidance, direction and personal-care time. Counselors are trained to assist the younger children with their daily needs, including personal hygiene, scheduling and meal times. We have programs in place to make this an easy transition for your young child. Please let us know any specifics about your child’s daily needs…we are here to help! Your child may find it helpful if you organize her clothing in Ziploc bags labeled by day or evening (include t-shirt, shorts, underwear, socks) to assist with her morning and evening routines. Also please send Velcro tennis shoes to make her camp life easier! Younger campers will need to practice washing her hair in the shower before she comes to camp. These recommendations will just make camp life easier for the young camper! What are some of the personal benefits of attending Riverview? The benefits of camping will include the opportunity to build self-confidence, strengthen social skills, increase cooperation, explore new activities, appreciate nature, form lasting memories and, experience healthy friendships interact with positive adult role models and grow closer to God. As you look through our website, we hope you hear our hearts…we just want to take care of your daughters in a safe place, providing great opportunities, good role models and creating opportunities for life-long meaningfulness … while we “empower” them to make good decisions in life! One of the goals that most of our parents/guardians tell us is that their wish is to lead their girls into becoming independent, confident children/young adults and enhance their childhood, teen years and their adulthood! Regardless of their length of stay, at camp…it is amazing how children will grow…Grow self-confidence and friendships and values that last a lifetime! 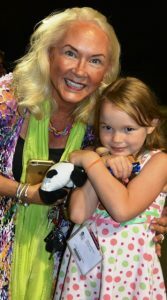 We think that “family” is the most important part of her life and we are grateful to be a part of your child’s “camp family”! We are so fortunate! To you, the parents and guardians, we just want to say Thank you! We believe that children are the wondrous beginnings that make a profound difference in the world around us! Your confidence in your child and in Riverview will by sensed by your child and will be celebrated by Riverview as we commit to support your parental success. To increase your confidence in Riverview, please watch the on-line segments from our parents and staff… listen to their experiences as well! What if I want to give camp or camp items as a “gift for a special occasion”? Giving camp as a gift is a great idea! Birthdays, Christmas, Valentines, Easter Baskets, etc. are perfect occasions for camp items! This gift includes… new friends and making great memories, s’mores, campfires, tennis, archery, swimming, canoeing, ropes course, climbing tower, chorus & drama, gymnastics, dance, cheerleading, horseback riding, adventure, inspiration, character and confidence building, and so much more! What are the benefits of Single-gender camping? Girls love living and learning and playing in an environment without the pressure of “boys”…Please watch this video to get the full answer! If you submit your application online, you will have the ability to submit a payment at that time with your credit or debit card. You may pay only the amount due or the entire balance. You are also given the opportunity to take advantage of automatic billing. This process comes at no extra charge to you, and will automatically bill your card a specified amount each month until May 1st (the deadline for all payments). This saves you time and hassle, and also helps spread out your payments. We also accept checks for online applications; on the payment screen you will be given the option to select "will send check." We can accept a credit card over the phone or a check by mail. We can also accept an online payment at any time. All of our online payment options are secure thanks to industry leading encryption.